For many months now, and have been the de facto control colors in Modern. Lightning Bolt and Path to Exile are great cards, and access to additional midgame haymakers like Supreme Verdict and Blood Moon is hard to argue with. That said, there’s a lot to be said for . You have access to all the discard spells backed up by cards like Snapcaster Mage and Jace, Vryn's Prodigy, as well as Damnation and various Lilianas to control the game. With the unbanning of Jace, the Mind Sculptor, does gain enough ground to come to the forefront of Modern? There’s a lot to like about control in the new Modern format. If everyone is going to be either casting Bloodbraid Elf or Jace, the Mind Sculptor or trying to kill you before you get the chance to cast a four-drop, then discard seems like a great place to be, since you can break up key combinations and strip away four-mana haymakers before they happen. Snapcaster Mage is particularly great in this deck because it can be used proactively to either buyback discard and break up your opponent’s midrange gameplans or reactively to double up on removal spells to keep your head above water. That said, the thing about this deck that is most exciting to me is Bitterblossom. We know how good Lingering Souls is in this format. 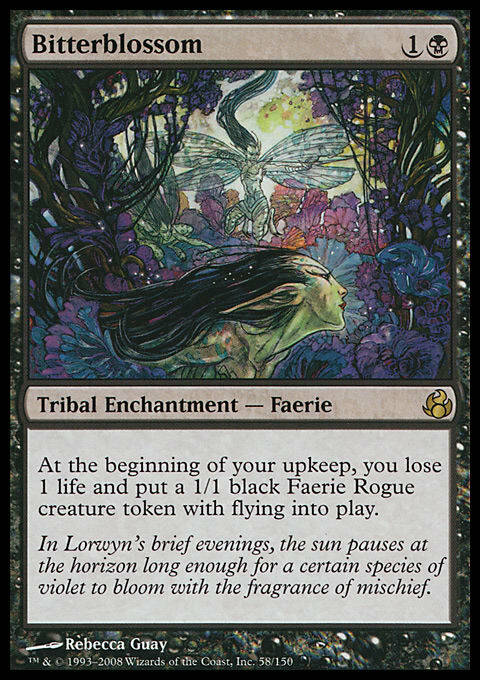 Bitterblossom has many of the same advantages as Lingering Souls, and the format has just shifted in a way that those tokens are much more important than they once were. Bitterblossom comes down underneath counterspells and starts netting tokens turn after turn. These tokens are great at both pressuring opposing Planeswalkers and defending your own. Whether you need to beat down an opposing Jace or keep Tarmogoyfs and Inkmoth Nexus away from your own Jace, Faerie tokens are exactly what you’re looking for. If you want to play control in the new format, but are looking for edges in the attrition-based matchups, I think this looks like a great choice. Early discard to strip away opposing haymakers backed up by counterspells and removal to protect yourself from topdecks ought to be a good place to be, and Bitterblossom is a card that I’d be very excited to play in the new Modern format.